Find parasailing in PA. Go para sailing in Pennsylvania at one of these great locations! Experience the high-flying thrill, panoramic views and pure excitement of parasailing down the New Jersey Shore. 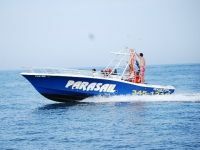 Come parasail at 500 feet over the beautiful Atlantic Ocean with East Coast Parasail. Experience for yourself the natural high of soaring above the Jersey Shore. When planning your next summer vacation to the Jersey Shore, be sure to check out East Coast Parasail. 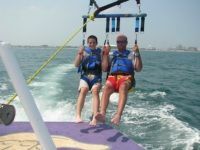 Parasailing is a safe and fun experience for the whole family. East Coast Parasail has a 100% safety record! Take off and land from the boat. You can get wet or stay dry- it's your choice. They offer single or tandem passenger flights, so you can fly with a friend or ride solo. Group rates are also available for parties of 6 or more flyers. The Offer Some of the Best Parasailing in NJ! It's just a short ride from Philly to Atlantic City, but once you get here, you can "see the city like never before" with one of the best parasailing services in New Jersey. Atlantic City Parasail is the only parasailing company in NJ, and offers you a beautiful view of the Atlantic City skyline as you glide 500 feet above the water. Scared of heights? Take a friend with you on a tandem flight - but there's no need to be frightened here: parasailing is perfectly safe, and these are the experts who have been doing it for years. Try Atlantic City Parasail, and get a different perspective! See the Jersey Shore Like Never Before With Belmar Parasail! 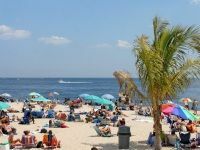 Have fun on the nearby Jersey Shore with Belmar Parasail! How does it work? You sit on board their beautiful boat's flight deck, seat under you, wind rushing by, and gently take off 500 feat into the sky! If you want to sit and enjoy the view, great! If you want to take a relaxing dip in the ocean, even better! They'll customize your ride for you, and you can even try it more than once to get the full experience. This is a fun, exhilarating, and, most importantly, safe way to enjoy the beach. 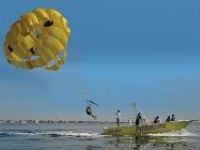 Don't miss out on all the parasailing action in NJ with Belmar Parasail! Enjoy Parasailing Action With Parasail Point Pleasant! Parasail Point Pleasant Beach operates one of the best parasailing outfits in the Tri-State Area. Their Captain has over 20 years of experience, and they use only the finest, safest equipment available. Can you imagine yourself soaring over the beautiful water with the sun at your back, and the wind in your hair, cruising safely at 500 feet, and holding tightly to a friend or loved one? They can, they do it all the time. You'll never have this much fun, so safely, for such a low price. 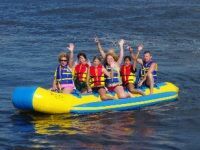 If you've always been curious about parasailing, or just want to give it a try, then head on over to Parasail Point Pleasant! Hang Loose Provides all the Para Sailing Action Near Pennsylvania! Now is the time to head over to Wildwood, and have the most fun of your life soaring high over the beautiful blue waters of the Atlantic Ocean. Why miss out? Parasailing with Hang Loose is extremely safe, and they maintain a 100% safety record with regards to their customers. From launching off the dock, to sending you straight up 500 feet in the air, to gently bringing you down to Earth, Hang Loose will make sure that you enjoy your exhilarating experience in safety and comfort. And you won't find deals like these just anywhere: check their website for more information, and get ready to Hang Loose!